Hani Simpson gets in the air while serving against Saturday’s tri-match host Northmont. 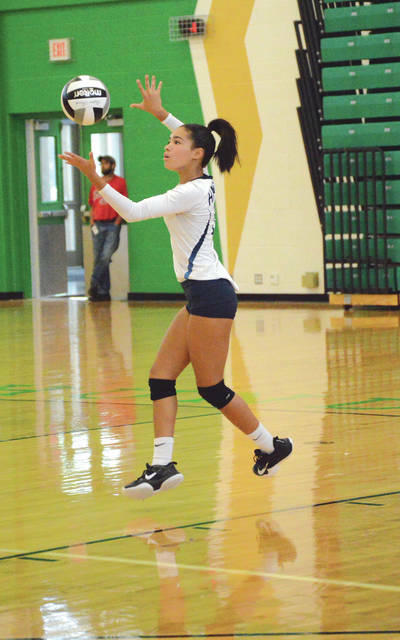 Simpson is but one of several talented new varsity players on the Fairborn girls high school volleyball team this season. Fairborn’s Ella Whalen (8) and Jessica Black (10) go after a ball hit by Northmont’s Carmynn Bonner, Aug. 25 in Clayton. Fairborn lost to Northmont and Oakwood in Saturday’s tri-match. 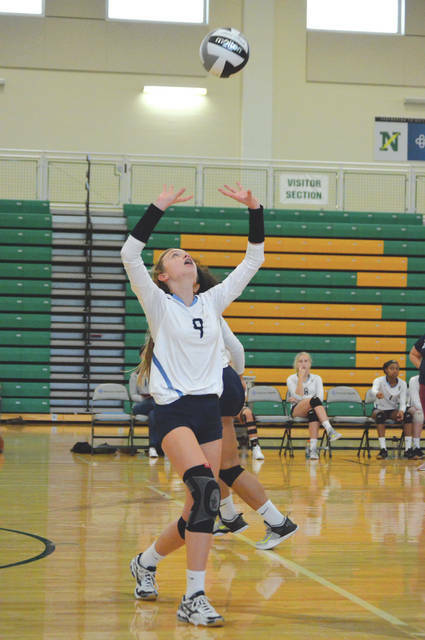 Skyhawks freshman Katie Knapp did a solid job of setting the ball for her Fairborn teammates in matches with Northmont and Oakwood, Saturday, Aug. 25 in Clayton. Sophomore Chariti Taylor keeps her eye on the ball during a girls high school volleyball match against Oakwood, Aug. 25 at Northmont High School. 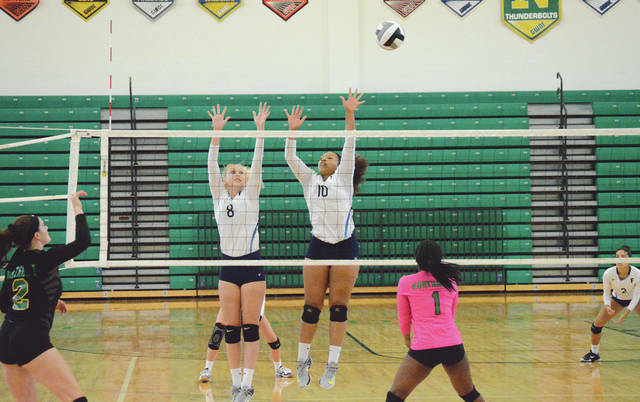 CLAYTON — The talent and ability is already there, now coach Tiffany Andrews hopes to find the right playing combination for her virtually new Fairborn Skyhawks girls high school volleyball team. Fairborn High lost a pair of matches in straight sets on Saturday afternoon. They fell 25-20, 25-17 in the opener to host Northmont. They then bowed out 25-15, 25-18 to Oakwood in the second match of the day. The youthful Skyhawks held early leads in each set. “We’re tending to sit on our bad plays, rather than put that error behind us,” Andrews explained. “And that’s when that bad play becomes four or five bad plays in a row. We’re almost a brand-new team, and so we’re working on getting comfortable with each other. We’ve been trying a lot of different rotations, and just trying to see what combination works best for us. Unofficially, senior Jessica Black had a pair of kills and a block in the loss to Northmont. Junior Darby Ballard and senior Brittany Hogan each came up with two kills, freshman Katie Knapp dished out several solid assists and had a kill and a service ace, while Skyhawk sophomores Hani Simpson and LeeAnn Williams and junior Ella Whalen recorded a kill each. Simpson led Fairborn (1-3) in kills in the Oakwood loss with five kills and a service ace. Williams bashed three kills, juniors Kenzi Culbertson and Ballard each had a pair of kills, Hogan had a kill, Whalen came up with a block, Knapp served up a pair of aces, and Black had a block and a kill. Northmont’s Joelle Selhurst led the Thunderbolts to the win over the Skyhawks. She had five of her match-best six kills in the opening set. Teammate Mya Kemp was next with five kills. The ‘Bolts are now 1-3 this season, and will host Springboro in Greater Western Ohio Conference, National West division play at 7 p.m. Tuesday, Aug. 28 for their next match. Carleigh Crowl and Ellie Jones of Oakwood gave Fairborn fits in the day’s second match. The two tall Jills combined for 12 kills, three blocks and a service ace. Crowl led the way with seven kills, a block and the ace. Oakwood (2-2) gets back into Southwestern Buckeye League, Southwestern division play on Aug. 28 when they head over to Brookville for a 7 p.m. match. 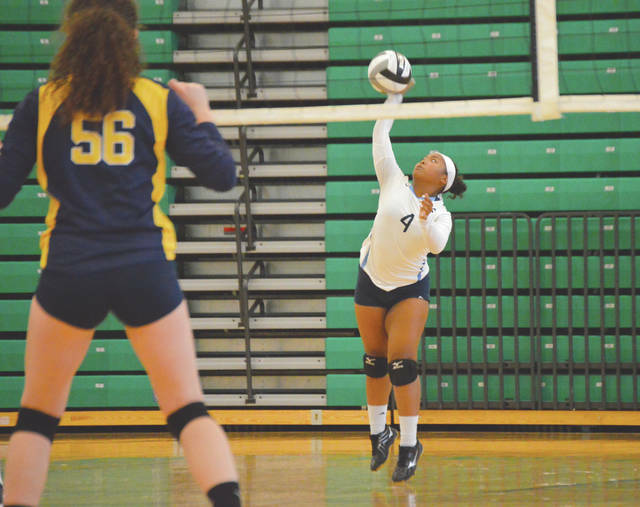 Already with one divisional win (a three-set home sweep of Trotwood-Madison on Aug. 21), the Skyhawks will take on the rest of the GWOC American South in its next three matches. Fairborn will host West Carrollton on Aug. 28. They then head to Riverside to take on Stebbins on Aug. 29, and will wrap up the South Division swing on Tuesday Sept. 4 at Xenia. All three games are set for 7 p.m. starts. Fairborn won the GWOC South title last season.